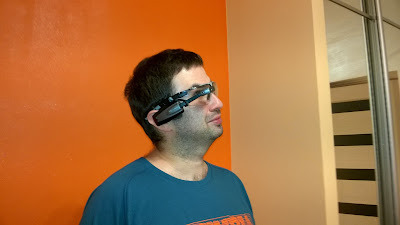 The Vuzix M100 Smart Glasses is an Android-based wearable computer, enhanced with a wearable monocular display. 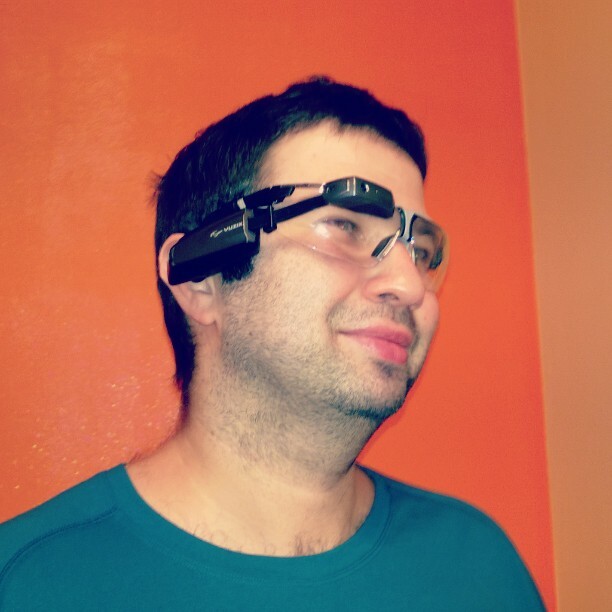 It's similar to Google Glass device and in addition to consumer availability It has several more advanced features: 3 DOF gesture engine (L/R,U/D,N/F), GPS, 3-degree of freedom head tracking, 3 axis gyro, 3 axis accelerometer, and 3 axis mag/integrated compass. I'm not sure it's too useful for enterprise app that the device is targeted to and for gaming it looks like pretty cool inventory. It mounts over glasses or like hands-free/headphones over Your head. Not too easy to make it suitable and in focus at least for me. From the second attempt and about a hour of time I've managed. The device is small, lightweight and suitable. It charges with standard USB charger. The screen is clean and bright and can be used in sunlight. It has several hardware buttons and gesture input, so can be used in noise and shaking industrial environments. There are camera, calculator and other office/mobile style apps per-installed and even own App Store with a lot AR titled apps. Looks like for large storing facilities and activity over there connected with e-commerce it's a proper solution. For more details welcome to watch the demo: SAP & Vuzix Bring you Augmented Reality Solutions for the Enterprise. It's a bit unexpected for the developer that SDK is paid and costs ~$/E150. Later on it's turned out that I've got it for free with kind support of sales team. It's not a gaming device at all and good enough in this area to realize that it's going to be games there for sure. Techcrunch says that Augmented Reality it's going to appear about a Year later after Virtual Reality consumer devices, so I've decided to wait too. ++ The original article on LinkedIn and a mirror on Medium.